As parts for our collectible autos become harder to find, it becomes necessary to reconsider parts that were once thought to be unsuitable. Higher prices for parts prompts the question: when do we repair an item rather than trying to find a suitable replacement? The $200 price tag one vendor asked for a replacement made our decision easy to salvage this ignition rotor. 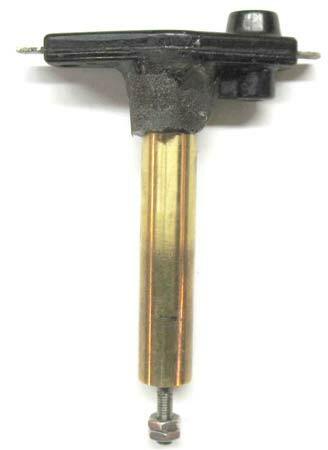 Our rotor is an original DELCO 018221 "boomerang" dual ignition rotor used on model L Lincolns and many other makes. Inspection and Preparation. Our examination of the rotor shows that the mounting post portion (i.e. the lower half) cracked and broke apart between the round base and the upper flat section. It's likely that the rotor broke because moisture locked it onto the distributor cam and it broke when the previous owner tried to pry it off. The friction fit mounting hole has two flat D shaped edges in its 0.750 inch diameter hole with one flat edge being longer than the other. The broken or missing pieces are long gone, so the only practical method to saving this rotor is to build up the missing round section. Even though the edges along the crack are jagged, it looks like the adhesive will need some help in getting the bond strength we desire. We drilled several small holes into the base's perimeter to allow the adhesive/filler to enter and giveus the greater strength we're looking for. The broken rotor shown with the missing section on the right side. Originally the rotor was level to the line. The broken rotor shown with the four holes drilled into the perimeter. The Repair. Using the dimensions of the distributor cam where the rotor rides, we fabricated a special mandrel out of solid brass stock. We will use this mandrel as a mold for the inside dimensions of the rotor. The adhesive/filler has to conform to the round shape with the two D shaped flat edges. We also have to be able to remove the rotor after it cures. 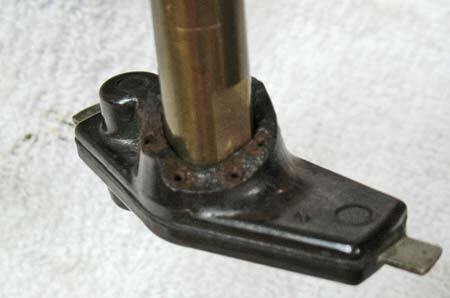 Fabricating the special brass mandrel required milling the flat edges on both sides and drilling, threading and inserting a long 10-32 threaded rod into the mandrel to permit the rotor to be gently pushed off the mandrel. Some light sanding of the mandrel's edges and trial fit onto the rotor proves the mandrel is ready for some light coats of mold release. 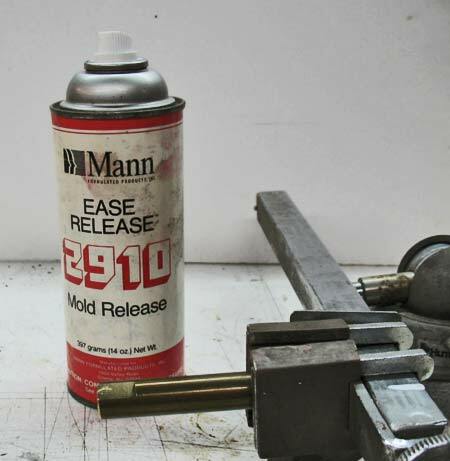 The release is a lubricant that will ease the rotor's removal after the Polyol has cured. The mandrel with the rotor attached was mounted in a small articulating ball bench vise that allows objects to be held in special angles. It's the "helping hands" you wished were available on every project and is commonly found in the model airplane and electronics hobbies. 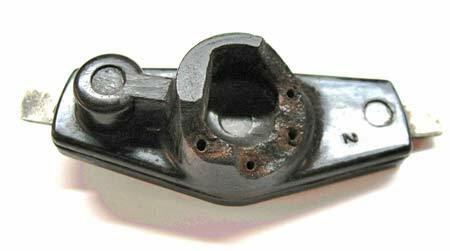 This permits the broken rotor to be oriented with the broken edges facing up and slightly inward. Several layers of masking tape were encircled around the rotor's base to form the outside mold for the filler. 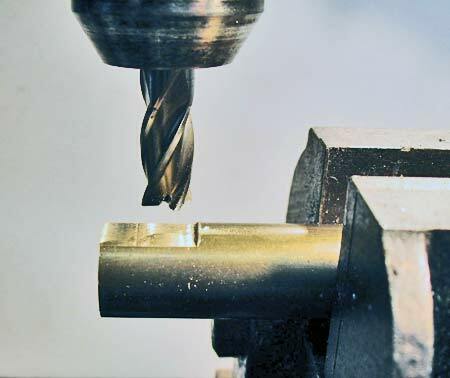 The 0.750 inch brass stock is held while an end mill makes several light passes to form the required shape for the mandrel's flat edges. Mold release is lightly sprayed onto the mandrel's tip before inserting the broken rotor. The mold release will ease the rotor's removal later. 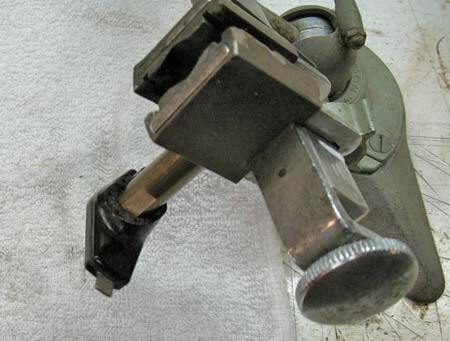 The mandrel with rotor attached is held in a ball style articulating vise makes it easier to apply the adhesive. The adhesive/filler selected was the two part (base and catalyst) Kwik Poly® Polyol, which has a low viscosity needed to seep into the original rotor material and the four small holes. Polyol has low shrinkage when cured and it can be tinted using dry pigment. Further, it can be thickened a little with small amounts of filler such as the silica supplied with the Kwik Poly kit or Durhams Water Putty, and it can be applied in layers to build up an area if necessary. After letting the Polyol fully cure (one full day at room temperature), the rotor is ready to be removed from the mandrel. Turning the threaded rod pushed the rotor off the mandrel as expected. After removing the repaired rotor from the mandrel, it is inspected for cracks or imperfections. Remember that Kwik Poly can be applied to itself, so any voids or surface imperfections can be corrected to improve strength with another coat if needed. Light sanding of the bottom edge on a belt sander reveals the crisp edges needed for the friction fit onto the distributor's cam. Close up picture of the broken area and holes are on the high side to permit applying the Kwik Poly and to allow it to seep into the holes. Not shown are several layers of masking tape that encircled the rotor to form the outer wall for the Kwik Poly® mixture. The rotor on the special mandrel after the adhesive/filler has cured. The next step is to slowly screw the threaded rod (double nut) to gently push the rotor off the mandrel. The repaired rotor after removal from the mandrel and inspected for cracks or imperfections. Note that after a light sanding on the belt sander, we intended that the back edge wall remains slightly thicker than original to provide greater strength.